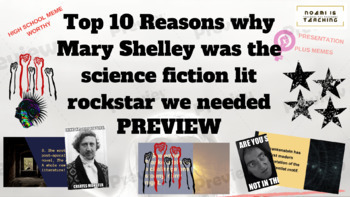 I made a fun presentation that covers Mary Shelley's life and work. If you’re like me, you like to engage with your teen students. Short, concise top ten lists and memes are a great way to do this. 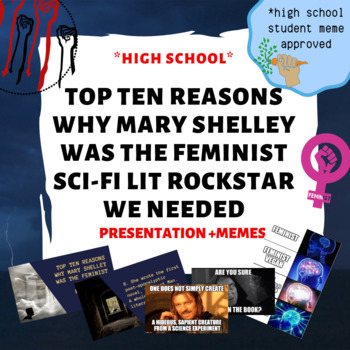 A top ten presentation on Mary Shelley, the radical feminist vegan science fiction writer we all needed. 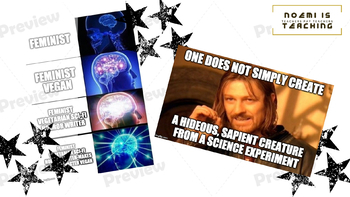 Keep in mind the photos and memes included in this presentation are intended for high school and higher education. 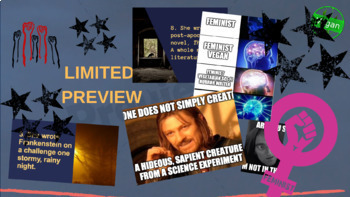 This presentation lists Mary Shelley as both a radical feminist and vegetarian in the presentation. *Included in the zip file is a folder with the presentation in JPG format and in PDF format. Please make sure you know how to unzip a file and project your presentation using jpgs or PDFs. Thank you for using Noemi is Teaching resources in your classroom. I hope this enhances your lessons on science fiction. Please let me know if this worked for you. **You are not able to edit this product. **This product is for PERSONAL/SINGLE CLASSROOM USE. Go to your My Purchases page after you log in. You'll see a button that's labeled "Provide Feedback button". Click and then you'll will be taken to a page where you can give a quick rating with a short comment for the product you purchased. Every time you give feedback, TPT gives you feedback credits that you use to lower the cost of your future purchases. To redeem credits: Once you've earned at least 20 credits, you'll see the option to apply credits at checkout. Just click the “Follow me” button under my store name and you're all set.